Ironwood Electronics has recently introduced a new high performance elastomer socket for 0.35mm pitch BGA package. The SG25-BGA-2054 socket is designed for a 2mmx2mm package size and operates at bandwidths up to 52 GHz with less than 1dB of insertion loss (GSSG configuration). The contact resistance is typically 20 milliohms per pin. Network analyzer reflection measurements for the G-S-S-G case were taken with all except the pins under consideration terminated into 50 Ohms. 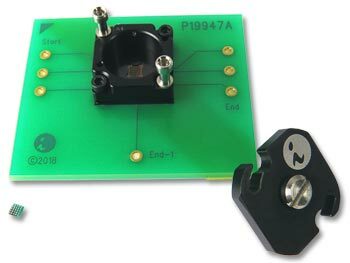 The socket is mounted using supplied hardware on the target PCB with no soldering, and uses smallest footprint in the industry (only 2 mounting holes). The smallest footprint allows inductors, resistors and decoupling capacitors to be placed very close to the device for impedance tuning. The socket also incorporates a simple swivel hardware installation method so that IC’s can be changed out quickly. Spring loaded compression plate is integrated into the swivel lid. This entry was posted on Thursday, October 18th, 2018 at 3:28 pm	and is filed under Advertiser, News.